The Natufians were a people in the prehistoric Levant from c. 12,500 to 9,500 BC who developed sedentary or semi-sedentary settlements to exploit wild cereals, and experimented in the early domestication of plants. Their descendants then eventually adopted the first agriculture after the Younger Dryas (c. 10,800–9,500 BC). It is possible that the phenomenon of “plant nurturing” (deliberate actions to increase the reproduction and spread of plants for food) was practised by Pleistocene hunter-gatherers long before agriculture proper was invented (Willcox 2012: 164). from c. 10,000 BC – Natufians shift back into permanent sedentary communities. From c. 13,000–c. 11,000 BC the Natufians lived in sedentary or semi-sedentary settlements in the Near East and harvested wild cereal plants, along with the usual hunting and gathering (Balter 2010: 404). This coincided with the Bølling-Allerød interstadial (12,700–10,700 BC), the first important warm and moist period after the end of the last glacial era. By this time, the Near East had changed from a treeless steppe during the Ice Age into a forest steppe environment with oak, olive trees, Pistacia atlantica, almond, grasses, and wild cereal vegetation. But when the earth was plunged into the Younger Dryas (c. 10,800–9,500 BC), the climate became dryer and colder, a process which caused a crisis in the Natufian culture as they experienced a shortage of plant and animal sources of food (Balter 2010: 404). The older theory on the origins of agriculture that had become a consensus by the late 1980s held that the pressures of the Younger Dryas (c. 10,800–9,500 BC) drove the Natufians to adopt agriculture as a survival strategy (Bar-Yosef and Meadow 1995; Balter 2010: 404). By the early 2010s, this hypothesis has been rejected by some archaeologists and historians, who see the Natufians of the Younger Dryas as in a transitional stage that was only moving towards agriculture (Balter 2010: 404), in which they experimented with wild plant cultivation. The skeptics think that the more mobile phase of the Late Natufian may actually have delayed full-scale agriculture (Balter 2010: 406). Maher et al. (2011) even argue that the effects of the Younger Dryas may not have been so bad as previously thought in many areas of the Near East. 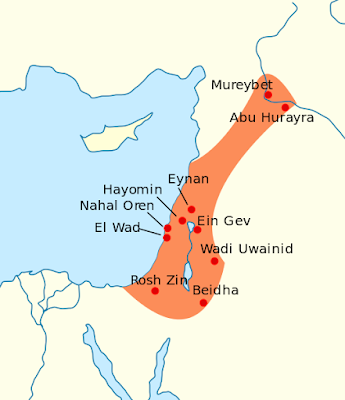 It is possible that rye was already domesticated around the period 11,000–10,000 BC at the site of Abu Hureyra in modern Syria, and evidence of tilling and cultivating of wild strains of rye and einkorn exists at a near-by site of Mureybit in the same period (Zeder 2011: S224–S225). At any rate, from 9,700 BC after the end of the Younger Dryas, the Holocene epoch of climate stability – with higher temperatures and regular rainfall – allowed the development of sustained cultivation and a reliable subsistence economy (Willcox 2012: 176–177). During the early Holocene in the Fertile Crescent, agriculture developed in independent sites where people learned to domesticate local plants (Willcox 2012: 177). There were nine Near Eastern wild plants that were domesticated and cultivated by the early agriculturalists over hundreds of years of artificial selection: emmer wheat, barley, pea, lentil, flax, broad bean, bitter vetch, einkorn wheat and chickpea (Willcox 2012: 166–167). Either emmer, einkorn, and pulses (and sheep, pigs, cattle, and goats) were first domesticated in the central Fertile Crescent, around the upper reaches of the Tigris and Euphrates rivers, or the process of domestication was more decentralised and occurred in multiple places around the Fertile crescent (Zeder 2011: S230). Hayden, Canuel and Shanse (2013) suggest that one motivation for cultivation of barley, wheat, and rye might have been to produce stable supplies of these cereals for brewing beer, not just making gruels or bread (Hayden, Canuel and Shanse 2013: 141). It seems that the development of farming also had genetic consequences: whether farmers evolved a higher general intelligence or were less violent than foragers is unclear, but early farmers evolved gluten tolerance (Willcox 2012: 164), and may have evolved lower time preferences (or the ability to delay gratification; see Clark 2007: 186–187) in contrast to hunter gatherers. Balter, Michael. 2010. “The Tangled Roots of Agriculture,” Science n.s. 327.5964: (January 22): 404–406. Bar-Yosef, Ofer and Richard H. Meadow. 1995. “The Origins of Agriculture in the Near East,” in T. Douglas Price and Anne-Birgitte Gebauer (eds. ), Last Hunters, First Farmers: New Perspectives on the Prehistoric Transition to Agriculture. School of American Research Press, Santa Fe, NM. 39–94. Bryce, Trevor and Jessie Birkett-Rees. 2016. Atlas of the Ancient Near East: From Prehistoric Times to the Roman Imperial Period. Routledge, London and New York. Clark, Gregory. 2007. A Farewell to Alms: A Brief Economic History of the World. Princeton University Press, Princeton. Hayden, Brian, Canuel, Neil and Jennifer Shanse. 2013. “What was Brewing in the Natufian? An Archaeological Assessment of Brewing Technology in the Epipaleolithic,” Journal of Archaeological Method and Theory 20.1: 102–150. Kuijt, Ian, Finlayson, Bill and Ofer Bar-Yosef. 2009. “Evidence for Food Storage and Predomestication Granaries 11,000 Years Ago in the Jordan Valley,” Proceedings of the National Academy of Sciences of the United States of America 106.27: 10966–10970. Maher, L., Banning, E., and M. Chazan. 2011. “Oasis or Mirage? Assessing the Role of Abrupt Climate Change in the Prehistory of the Southern Levant,” Cambridge Archaeological Journal 21: 1–29. Maher, Lisa A., Richter, Tobias and Jay T. Stock. 2012. “The Pre-Natufian Epipaleolithic: Long-term Behavioral Trends in the Levant,” Evolutionary Anthropology 21.2: 69–81. Rosen, Arlene M. and Isabel Rivera-Collazo. 2012. “Climate Change, Adaptive Cycles, and the Persistence of Foraging Economies during the Late Pleistocene/Holocene Transition in the Levant,” Proceedings of the National Academy of Sciences of the United States of America 109.10 (March 6): 3640–3645. Willcox, George. 2012. “Beginnings of Cereal Cultivation and Domestication in Southwest Asia,” in D. T. Potts (ed. ), A Companion to the Archaeology of the Ancient Near East. Wiley-Blackwell, Chicester, UK. 163–180. Zeder, Melinda A. 2011. “The Origins of Agriculture in the Near East,” Current Anthropology 52.S4: S221–S235. Thomas Robert Malthus’ An Essay on the Principle of Population was first published in 1798. An influential revised edition followed in 1803, and a sixth edition in 1826. In this work, Malthus mulled over the population, social and economic trends that we now call Malthusianism. Darwin began reading Malthus on 28 September 1838. After he finished reading it on 3 October 1838, he soon formulated the principle of natural selection (Browne 1995: 388–390). He also took inspiration from the creation of new breeds of animals by artificial selection, and from the work of Charles Lyell which emphasised the struggle of survival between species. Darwin seems also to have taken inspiration from Adam Smith’s metaphor of the “invisible hand”: only it was the “invisible hand” of differential survival rates of individuals of the same species in nature, selected for their greater fitness given accidental genetic traits, that was the mechanism for evolution of individual species (Browne 1995: 389). “In October 1838, that is, fifteen months after I had begun my systematic enquiry, I happened to read for amusement ‘Malthus on Population,’ and being well prepared to appreciate the struggle for existence which everywhere goes on from long-continued observation of the habits of animals and plants, it at once struck me that under these circumstances favourable variations would tend to be preserved, and unfavourable ones to be destroyed. The result of this would be the formation of new species. Here then I had at last got a theory by which to work; but I was so anxious to avoid prejudice, that I determined not for some time to write even the briefest sketch of it. In June 1842 I first allowed myself the satisfaction of writing a very brief abstract of my theory in pencil in 35 pages; and this was enlarged during the summer of 1844 into one of 230 pages, which I had fairly copied out and still possess.” (Darwin 1911: 68). “I this morning received your pleasant and friendly note of November 30th. …. You are right, that I came to the conclusion that selection was the principle of change from the study of domesticated productions; and then, reading Malthus, I saw at once how to apply this principle. Geographical distribution and geological relations of extinct to recent inhabitants of South America first led me to the subject: especially the case of the Galapagos Islands. I hope to go to press in the early part of next month. It will be a small volume of about five hundred pages or so. I will of course send you a copy. …. .” (Darwin 1903: 118–119). Browne, Janet. 1995. Charles Darwin: Voyaging. Volume 1 of a Biography. Pimlico, London. Darwin, Francis (ed.). 1903. More Letters of Charles Darwin: A Record of his Work in a Series of Hitherto Unpublished Letters (vol. 1). John Murray, London. Darwin, Francis (ed.). 1911. The Life and Letters of Charles Darwin, including an Autobiographical Chapter (volume 1). D. Appleton and Company, New York and London. Desmond, Adrian and James Moore. 1991. Darwin. Penguin Books, London. I have made this chronology to complement my summaries of Gregory Cochran and Henry Harpending’s The 10,000 Year Explosion: How Civilization Accelerated Human Evolution (2009). Chapter 1 of Gregory Clark’s A Farewell to Alms: A Brief Economic History of the World (2007) is called “The Sixteen-Page Economic History of the World,” which briefly summaries the broad, long-run economic history of humanity. (1) from the earliest times of hunter-gatherers until roughly 1800 humanity was stuck in a long-run Malthusian trap: per capita wealth may have varied somewhat in different times and places, but there was no sustained, great upward trend in global per capita wealth. While some societies managed short-run economic growth even in per capita terms (and here the phrase “short-run” might mean as long as a century or so), nevertheless, in the long run, advances in per capita wealth by means of technological or other advantages were inevitably lost because of population growth. (2) after 1800 the power of Western science, technology and the Industrial Revolution ended the Malthusian trap for Europeans and most of their colonial societies, and for much of humanity (Clark 2007: 1), though the Malthusian trap persists in some places. Clark (2007: 2) argues that, for the average person in 1800 (even in a place like Britain), life was not much better than in Stone Age hunter gatherer societies, a claim I find a bit absurd and exaggerated. Nevertheless, the broad points about the historically important limitations of the Malthusian trap through much of history seem sound. Clark (2007: 3) contends that, even today, in much of sub-Saharan Africa, the introduction of Western technology has not allowed all societies there to escape the Malthusian trap because of excessive population growth. Paradoxically, the Industrial Revolution has created a Great Divergence between the richest, industrialised nations and the poorest nations of the Third World (Clark 2007: 3). (3) Why did the Great Divergence happen and persist? (Clark 2007: 3). Humanity was trapped in a Malthusian world before 1800 because the rate of technological innovation was too low: perhaps the pre-1800, average rate of technological advancement was considerably below 0.05% per year (Clark 2007: 5). Paradoxically – in a pre-modern world subject to Malthusianism – prosperous periods of peace, order, stability, public health, welfare to the poor, and economic growth stimulated the population growth that ultimately impoverished those societies and reduced per capita wealth (Clark 2007: 5). Hence fertility control was a major driver of improved material prosperity in pre-industrial societies (Clark 2007: 5). Clark points to an important principle that is also stressed by Gregory Cochran and Henry Harpending’s The 10,000 Year Explosion: humanity was still subject to Darwinian evolution by natural selection in the Malthusian era, and even after the development of old agrarian societies after the Neolithic Revolution from 10,000 BC (Clark 2007: 6). Alfred Russel Wallace (1823–1913) read Malthus while in the Spice Islands in 1858 – and made the same deduction as Darwin, and in the process developing a theory of evolution too (Desmond and Moore 1991: 468). Darwin and Wallace discovered evolution by natural selection not long before the horrors of the Malthusian world were finally ending for the European peoples. (3) pre-industrial England was therefore a society of constant downward mobility, in the sense that the children of the elite and wealthier classes, on average, moved downwards in the social hierarchy in order to live and find work (Clark 2007: 7). So therefore the general genetic traits of the wealthier classes in England – plausibly likely to be higher intelligence, patience, hard work, innovativeness, and low time preference – were thus spreading genetically throughout the population for centuries as a pre-condition for the Industrial Revolution (Clark 2007: 8). The same type of genetic changes may well have happened in other mercantile, commercial societies where the success of people with given biological traits led to long-run reproductive advantage and general evolutionary change. As we can see, there was a sharp fall in the fertility rate throughout the West from the 1870s, but this accelerated the declines that were already underway after about 1800. Shockingly, some nations like Britain and Germany even had sub-replacement fertility rates below the magic rate of 2.1 even by the 1920s/1930s. As Clark points out, it was not just the rapid and historically unparalleled economic growth that broke the Malthusian trap for Europeans, the falling fertility rate also was a major factor in the rising real per capita GDP and wealth of the West (Clark 2007: 8). Clark also argues that the explanation for the emergence of the Industrial Revolution in England requires a complex set of factors in the long-run from 1250–1860 (Clark 2007: 10). Crucially, Clark even argues that the whole economic history of humanity must be set within possible differential evolution of human beings in different societies, not only in terms of culture, but also under different selective pressures. Above all, Old Agricultural Societies may have produced people with different genetic and behavioural traits from other peoples (Clark 2007: 10). Why did an Industrial Revolution occur in England in the time it happened, and not in China or Japan? Whether natural resource advantages in coal, or colonies, or cultural changes of the Protestant Reformation contributed, Clark thinks that evolutionary change brought about by demographic trends in England, both in culture and possibly genetics, created a people who were also a fundamental condition for the Industrial Revolution (Clark 2007: 11). Finally, Clark turns to the Great Divergence and the persistence of failed economic growth in parts of the Third World, and thinks that failure to adapt to the cultural values and institutions of the industrialised societies are major factors. Here the discussion suffers from Clark’s ignorance of left heterodox and Post Keynesian economics. (1) “The 10,000 Year Explosion, Chapter 1: A Summary,” July 20, 2017. (2) “The 10,000 Year Explosion, Chapter 2: A Summary,” July 21, 2017. (3) “The 10,000 Year Explosion, Chapter 3: A Summary,” July 22, 2017. (4) “The 10,000 Year Explosion, Chapter 4: A Summary,” July 23, 2017. (5) “The 10,000 Year Explosion, Chapter 5: A Summary,” July 24, 2017. (6) “The 10,000 Year Explosion, Chapter 6: A Summary,” July 24, 2017. (7) “The 10,000 Year Explosion, Chapter 7: A Summary,” July 26, 2017. (8) “The 10,000 Year Explosion, Conclusion: A Summary,” July 26, 2017. (4) agriculture caused a 10,000 year explosion: it resulted in the acceleration of both cultural and biological evolution from much larger populations with a higher rate of mutation, in the new environments created by agriculture. Farmers evolved to be significantly different from hunter gatherers both in metabolism and cognition. (6) biological and evolutionary change in human beings has also been a neglected but crucial driving force of human history, e.g., the epic expansion of the Indo-Europeans owing to their mutation allowing lactose tolerance into adulthood, the European settlement of the Americas, the failure of Europeans to penetrate Africa until the 1880s, and the evolution of the Ashkenazim in Europe (Cochran and Harpending 2009: 225–227). Cochran and Harpending (2009: 207) conclude by speculating that perhaps even the industrial revolution and the rise of science have underlying biological or evolutionary influences not yet understood. (9) unique genetic change induced by extraordinary events (e.g., plague, genocide, an ethnic minority subject to persecution), which might cause bottleneck effects, founder effects, etc. (10) higher-level group evolutionary changes might be driven by inter-group competition and differences in group fitness (e.g., an analogy from the animal kingdom is evolutionary arms races). Chapter 7 of Gregory Cochran and Henry Harpending’s The 10,000 Year Explosion: How Civilization Accelerated Human Evolution (2009) is called “Medieval Evolution: How the Ashkenazi Jews got their Smarts,” and looks at the evolution of the Ashkenazi minority within Europe over the past 1,500 years. The chapter is based in part on earlier work in Cochran, Hardy and Harpending (2006). The Ashkenazim were a Diaspora Jewish community that was first based in northern France and Germany in the 8th–9th centuries AD, but were descended from a Diaspora community in southern Europe during the Roman empire in which a significant number of the men of the founder population took European wives (Cochran and Harpending 2009: 204–205; Costa et al. 2013). The Ashkenazim were therefore, by origin, a cline (admixture) of Middle East Jews and some European women. This is still evident today in modern Ashkenazim, who have about 40% European DNA (Cochran and Harpending 2009: 204). However, after the early founder admixture, the Ashkenazim became highly endogamous (that is, marrying only within their group) and genetically isolated (Cochran and Harpending 2009: 205, 219). From the later Middle Ages the Ashkenazim began moving into Eastern Europe and Russia, and modern Ashkenazim are present in America, Israel and Europe. The Ashkenazim have an average IQ that lies somewhere in the 107–115 range, the highest average IQ of any ethnic group in the world. The average IQ of Europeans, by contrast, is 100. In the modern world, the Ashkenazim are significantly overrepresented in certain higher professions requiring a high IQ, such as the natural and social sciences (Cochran and Harpending 2009: 188–190). In particular, while the Ashkenazim are less than 0.2% of the world population, they are about 22% of Nobel laureates (though most are men, as you can easily see here). Cochran and Harpending argue that this high average IQ was driven by genetic changes in the Ashkenazim over about a thousand years while living as a persecuted minority in Europe. (3) because of the very high rates of endogamy (marrying only within the group), the differential success and higher birth rates of the most successful Ashkenazim, over time, led to a kind of elite reproductive advantage with genetic effects on the general population, which gradually raised the average IQ of the Ashkenazim as a group (Cochran and Harpending 2009: 191–220, 222–223). The high average Ashkenazi IQ is therefore largely genetic, and the product of an unusual evolution over the past 1,000 years or so. Further evidence in favour of this is that – in Israel with its First World economic development, education and health care system – the Ashkenazim continue to have an average IQ higher than both Sephardic and Oriental Jewish groups, who have had a different evolutionary history (Cochran and Harpending 2009: 212–213). The by-product of the evolution of high Ashkenazi IQ was probably a number of unusual genetic diseases in the Ashkenazim, such as Tay-Sachs, Gaucher’s disease, familial dysautonomia, and two forms of hereditary breast cancer (BRCA1 and BRCA2). These diseases are about 100 times more common in Ashkenazim than in European populations (Cochran and Harpending 2009: 188), and they are characterised by affecting two specific metabolic pathways, the first of which is probably related to the central nervous system and neuron development, namely, sphingolipid storage disorders (causing Tay-Sachs, Gaucher’s disease, Niemann-Pick disease, mucolipidosis, type IV) (Cochran and Harpending 2009: 214, 220). As Cochran and Harpending (2009: 190–191) point out, the high average IQ of the Ashkenazim has greatly contributed to modern science, and – in a sense – has changed human history because Western science has been significantly advanced by high IQ Ashkenazi men: we need only think of Albert Einstein, Max Born, John von Neumann, Richard Feynman, Julian Schwinger, Murray Gell-Mann and numerous others who have changed the course of Western science. The social consequence of a higher average IQ group is that this increases the sheer numbers of the group on the right-hand side of their bell curve distribution: this means that with an average IQ of 100 for Europeans and an average IQ of 110 for Ashkenazim, there will be about 4 per 1,000 Europeans with an IQ greater than 140, but 23 per 1,000 Ashkenazim with an IQ greater than 140 (Cochran and Harpending 2009: 211). In an egalitarian society, this explains why a high-IQ minority group will be highly overrepresented in professions requiring a high IQ. And as Steven Pinker points out in the videos below, this is a straightforward, even banal, scientific explanation which can be used to combat and refute far-right anti-Semitic conspiracy theories. So truth can help counter the modern Far Right, just as biological truths can be used to counter modern SJWs and their unhinged denial of biological gender differences. There is also a question and answer session here. Cochran, Gregory, Hardy, Jason and Henry Harpending. 2006. “Natural History of Ashkenazi Intelligence,” Journal of Biosocial Science 38.5: 659–693. Chapter 6 of Gregory Cochran and Henry Harpending’s The 10,000 Year Explosion: How Civilization Accelerated Human Evolution (2009) is called “Expansions,” and examines the genetic effects of large-scale migrations of human beings. History is filled with examples of certain population groups that conquer, migrate into, or spread over large areas and replace other groups, or replace other groups with some mixing. Cochran and Harpending (2009: 156) accept that cultural and technological advantages have played a large role in the success of such movements, but also contend that sometimes, in important cases, evolutionary genetic traits have also been a factor. In this respect, as in normal evolutionary theory, we must look at group fitness, and not just individual fitness, as factors in human history (Cochran and Harpending 2009: 158). Three major examples are analysed in Chapter 6: (1) the success of Europeans in the New World, (2) early European attempts to colonise sub-Saharan Africa, and (3) the astonishing success of the prehistoric Indo-European-speaking peoples. The first example Cochran and Harpending point to was the European colonisation and conquest of the New World. We know that the Native Americans faced a severe group disadvantage caused by differential evolution: namely, their inability to resist or have immunity to new diseases brought by Europeans like smallpox (Cochran and Harpending 2009: 158–159). The HLA gene alleles, in various forms, protect human beings against infectious disease by regulating the nature and strength of the immune system. But the Amerindians had an unusual distribution of HLA alleles – evolved from their distinct evolutionary history in the Americas – and a much weaker immune system, because they were simply not exposed to the same type and variety of pathogens as the farming peoples of the Old World (Cochran and Harpending 2009: 160–161, citing Cavalli-Sforza and Paolo Menozzi 1994). But the weaker immune systems of Amerindians had an advantage in their distinctive environment: they were much less subject to autoimmune diseases than other peoples with stronger immune systems (Cochran and Harpending 2009: 161). As an aside, it’s curious that this documentary based on Jared Diamond’s Guns, Germs and Steel does not explicitly acknowledge the biological and evolutionary implications of the New World epidemics, because the truly terrible and tragic deaths of millions of Amerindians was the result of different kinds of group genotypes and phenotypes between Amerindians and Europeans, and hence different kinds of group fitness, caused by differential, regional evolution. As Cochran and Harpending (2009: 169) emphasise, anybody who refuses to understand the fundamental role of biological differences between human populations as a factor in European conquest of these regions is in effect denying the reality of Darwinian evolution. Early attempts to conquer or colonise Africa, even just for trading purposes, encountered a severe difficulty: Europeans discovered that the diseases of Africa had a devastating effect on them. The European people in early expeditions, trading missions and settlements suffered an extremely high death rate from Africa diseases which they had not evolved immunity to (Cochran and Harpending 2009: 171). For example, British soldiers in the Gold Coast died at a rate of 50% (Cochran and Harpending 2009: 171). Right up until the early and mid-19th century, a European conquest of Africa – despite the staggering technological and scientific superiority Europeans had – just wasn’t possible in the way that Europeans conquered the New World. The only major area where colonisation worked was South Africa, and this was because of the temperate climate and the difference in the prevalence of diseases. Once again, the reason was biological, and was simply the lack of immunity and a different evolutionary history: whereas Africans had evolved their immunity to local diseases and pathogens over thousands of years, Europeans had no such immunity. It was only with the discovery of drug treatment with quinine in the 1800s that Europeans had a defence against falciparum malaria, and, as scientific medicine began to deal with other tropical diseases, Europeans were able to conquer most of Africa from the 1880s (Cochran and Harpending 2009: 173). One of the greatest successes of prehistory was the large-scale Indo-European migrations and conquests in which, over thousands of years, Indo-European people of the Yamnaya culture north of the Black Sea, spread out in all directions (Allentoft et al. 2015: 171; Balter and Gibbons 2015). There was for many years a scholarly debate about the original homeland of the Indo-Europeans with scholars like Colin Renfrew proposing that the homeland lay in ancient Anatolia (Cochran and Harpending 2009: 178). However, it is now widely accepted that the original Indo-European homeland was in what is now southern Russia above the Black sea (Cochran and Harpending 2009: 179). For example, from 3,000 to 2,000 BC, there was massive Indo-European migration of people from the South Russian steppe into central Europe, and then into northern and western Europe, and now virtually everybody in Europe speaks an Indo-European language. But modern Iranian and Hindi and Urdu – the major languages of the Indian subcontinent – are also Indo-European. The Indo-Europeans probably had a phenotype with brown eyes, pale skin, and taller height (but interbreeding with other population groups has changed this phenotype, especially in India). The Indo-European language family was so successful that it now has about 3 billion native speakers, or about 50% of the human race (Cochran and Harpending 2009: 174). So why were they so successful? The Indo-Europeans were not only farmers but also cattle herders, and raised cattle, sheep, goats and pigs, and they may have domesticated the horse (Cochran and Harpending 2009: 176). They seem to have had wheeled carts and chariots, at least in the later stages of history. But Cochran and Harpending argue that the crucial biological trait that the Indo-Europeans had was lactose tolerance into adulthood, caused by the 13910-T allele, which allows the continued synthesis of lactase (an enzyme that digests milk sugar) past chidlhood (Cochran and Harpending 2009: 180–181; Allentoft et al. 2015: 171). This, they argue, was why the Indo-European peoples were so successful and expanded so many times in thousands of years of history. With their lactose tolerance into adulthood, Indo-Europeans could become highly effective dairying pastoralists, as well as farmers, and could actually produce more high-quality food on a given amount of land than other pastoralists (Cochran and Harpending 2009: 181). In effect, Proto-Indo-European pastoralism had great advantages in inter-group competition, and there was a biological basis to this (Cochran and Harpending 2009: 182). Indo-Europeans could also abandon farming and become mobile pastoralists, a style of life which has clear military advantages, in contrast to sedentary farmers (Cochran and Harpending 2009: 182). Their dairy-rich diet also gave them greater height, and they soon developed a warlike society (Cochran and Harpending 2009: 183). So, first of all, Indo-Europeans spread all over the steppe near their homelands, and then into Europe, where they had the edge in inter-group competition and in group fitness against the early European farmers (Cochran and Harpending 2009: 184). Indo-Europeans seem to have conquered or displaced many earlier Europeans, but, perhaps more generally, ruled as an elite and imposed their languages on the native populations (Cochran and Harpending 2009: 184). Interbreeding with Indo-Europeans and gene sweeps then allowed modern Europeans to acquire the trait of lactose tolerance (Allentoft et al. 2015: 171). Indo-Europeans also spread out eastwards into Central Asia, Iran and even into India. Underlying this astonishing history of success was the mutation, or mutations, that produced their adult lactose tolerance. Andrew Curry, “Archaeology: The Milk Revolution,” Nature, 31 July 2013. Ann Gibbons, “Nomadic Herders left a Strong Genetic Mark on Europeans and Asians,” Science, 10 June 2015. Diamond, Jared M. 2005. Guns, Germs and Steel: The Fates of Human Societies. Vintage, London.